In a modern warehouse or factory, the storage and internal distribution of items is one of the most important parts of the business process, as this is where you can exercise the most control and have the biggest effect on efficiency and productivity. By installing proper bulk material handling equipment throughout your business premises, you can improve all aspects of storage and distribution to ensure that your staff have everything they need to carry out their jobs to the best of their abilities. One of the first places where you can make improvements within any ware house’s capacity for work is in the storage area. By installing higher quality shelving and rack space, you will enable your business to stock larger amounts of raw materials, and then also give better access to any supplies using the bulk material handling equipment that is so essential to efficiency. There are many different kinds of shelving available including special long span units that offer better access to inventory for any forklift trucks, and even cantilever shelving where there are no pillars to get in the way of access, and this will allow for unfettered access and the ability to store many more pallets in the same amount of space. 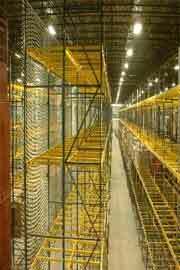 Once you have finalized the structure of your storage area and installed the right shelving to meet the needs of your business, considering the right bulk material handling equipment to carry goods around the workplace to supply the various production areas is an essential step in creating the best possible processes. One of the main foundations of a modern industrial or manufacturing facility is the fork lift truck, and as far as possible, every area of the factory should be designed with making fork lift access a priority, as this will allow for all the associated bulk material handling equipment to be moved into place as and when it is required. You will be able to use the fork lift truck in conjunction with many of the adaptations available for it to carry items from the storage area through to production staff, and make the supply chain within your factory as short as possible. Of course, there will always be circumstances where you cannot use a forklift as your main form of bulk material handling equipment, and as a result, there are numerous other pieces of equipment available that are able to perform many of the same functions under specific conditions. One of the most useful items in any workplace is a pallet jack. These hand pushed carts can carry a fully laden pallet around from one place to another without any problems. They can get into areas where fork lifts cannot, and thanks to their lower speed and ease of control, present very little risk to staff in the event of a spill or slip. Installing cranes wherever necessary will allow for material to be lifted into place on a workbench or into a truck for distribution from the factory, and ensure that staff are not required to lift heavy items and put their health at risk under any normal circumstances. As you continue to read through our selection of Bulk Material Handling Equipment, keep in mind we stand ready to answer any questions you may have about our offerings. Call us at 1-888-776-3720 whenever such questions arise and let us help you make the best investment within your budget. We are located in Houston, Texas.